The movie opens with two gunslingers, Virgil Cole (Ed Harris) and Everett Hitch (Viggo Mortensen) making their way into a small town in New Mexico. From there the movie seems like a predictable Western until Ally French (Renée Zellweger) shows up. In an awesome opening scene with Ed Harris, we learn she’s not married, not a prostitute, and Virgil is not entirely comfortable with women. This may be unusual fare for a Western, but it’s where Appaloosa excels. I love how damaged and needy the three leads are. You could take all three and dump them in an urban setting with drugs to make some sort of action romance hybrid movie. But if you did it would be a shame. 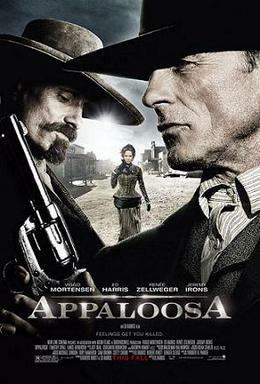 Appaloosa is at its best when it’s toying with your expectations about Westerns. Ally fascinates me because she’s a slave to her needs. She tries to sleep with all the leads and then some. At one point, Hitch’s girlfriend suggests Ally sleeps around to ensure her own safety and well being. Although there is some evidence to support this, it doesn’t explain why Ally attempts to seduce Everett soon after she commits to Virgil. This is a dangerous move on her part, and it seems as if the movie is turning into a love triangle drama, but then Virgil easily sees through Ally when she attempts this gambit, and the scene turns into an odd homage of the buddy trope most Westerns revere. Not long after we discover how needy Ally is, we suddenly realize that Virgil isn’t much better. He knows she is promiscuous, but decides he can’t live without her. Harris nails this scene, describing with good natured aplomb how she bathes and chews her food, yet can’t possibly be trusted around any other males. And then this scene is followed by a gunfight that erupts so quickly there is only time for a few hurried instructions before the shooting begins. The aftermath of violence is shocking: both men lie bleeding in the dirt, surrounded by dead men. But even more shocking is the realization that nothing Ally has done to survive on the frontier can compare to what these two are doing. Everett is probably the most well adjusted of the three, but even that’s not saying much. At one point, he admits to his prostitute girlfriend that he “only killed one person outside the law.” Despite this bald admission, Everett is undoubtedly the movie’s hero. When Ally tries to seduce him, he doesn’t find it difficult to resist her at all. He says, “We’re both with Virgil, Ally. We can’t.” Perhaps we like him so much because he seems to worship Virgil. In the end, Everett takes the law into his own hands, but he’s also putting his life on the line so Virgil can have a chance at a new kind of life, one where there is no longer a place for Everett. It’s both selfless and violent act, and then he rides off into the sunset, like a good Western hero should.